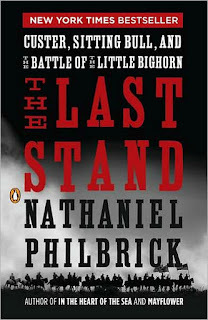 The Last Stand: Custer, Sitting Bull, and the Battle of the Little Bighorn, Nathaniel Philbrick, Viking Press, 466 pages, 18 maps, 64 b/w images, 11 color images, notes, bibliography, two appendices, 2010, $30.00 hardcover, $18.00 paperback. The United State centennial celebration, the Democratic national presidential convention, and army politics are several of the many issues for George Armstrong Custer. The facets of Custer the man include glory seeking, charisma, the ability to deny obvious realities, personal arrogance, and a cheating heart. Sitting Bull is shown to be a prophet, warrior and chief. Philbrick states that Sitting Bull was "convinced that he alone had his people’s welfare in view, a conviction that inevitably exasperated those Lakota attempting to meet the challenges of reservation life in their own way." Regarding his description of the Battle of The Little Big Horn and Indians' two day siege of Reno's troops, Philbrick is cautious in his claims. He relies on the army's inquiry testimony, survivors accounts, Native American accounts, Libby Custer's promotional efforts and modern archaeology to reveal the discrepancies of past narratives. Multiple points of view are presented in his narrative of specific events such as Custer's wounding and later death, Benteen's and Reno's character and the Native Americans attitudes toward their own chances of self defense. Overall, Philbrick's account is judicious in the weight he gives terrain and weather, weapons and logistics, and behaviors during crises. 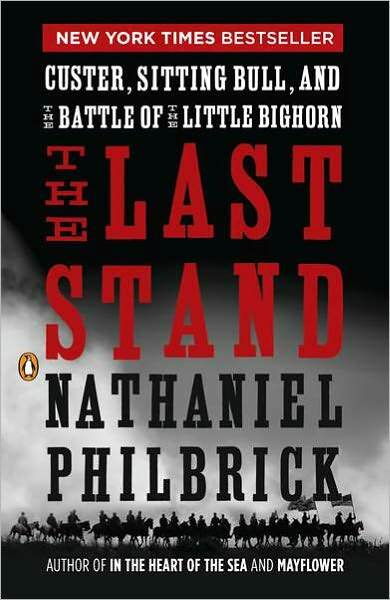 Compellingly written, informative and fair, Philbrick's The Last Stand is an engaging history book. Robert Gudmestad, Associate Professor at Colorado State University has an invitation for those doing research on Confederate wartime writings and Confederate postwar writings. Here is his offer that was sent to H-War@h-net.msu.edu, a listserv. 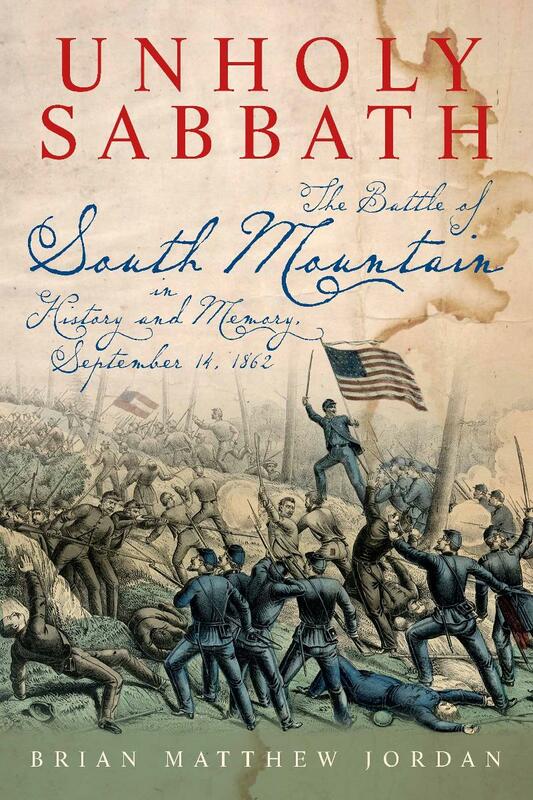 New and Noteworthy---Bloody Sabbath Before Antietam: How Did The Confederates Remember The Battle of South Mountain? Unholy Sabbath is the first, complete, full-length published study on the South Mountain battle (September 14, 1862). Brian Jordan recently discussed his book with Lindy Gervin of Savas Beatie LLC. LG: The Confederates remembered the battle differently, didn’t they? BMJ: Yes they did. The real meaning and import of the fighting suffered from the active postwar revisionism of its Rebel participants. Confederates had little desire to remember a battle in which the Federals wrestled away the higher, better ground from an army that had never been driven from the field, and in doing so, score an unprecedented victory that changed the course of the entire campaign by disrupting General Lee’s plans completely. There was much more romance in the story of an exhausted, barefoot army boldly striking north across the Potomac River, fighting it out against a larger and better equipped Army of the Potomac at Sharpsburg, standing on the field all the following day, and then making an organized (but not demoralized) retreat back to Virginia. South Mountain was a problem for the Confederates to overcome historically speaking, but the remedy was ready-made in the Lost Cause mythology, which I explain in the last chapter of Unholy Sabbath. CWL: The entire interview is found at Libri Novus, the newsletter of Savas Beattie Publishing. Battlefield Woodlot To Undergo 'Health Cuts': Effort Is Intended To Promote Tree Growth In The Historic Woods, Tim Prudente, The Evening Sun, January 5, 2012. 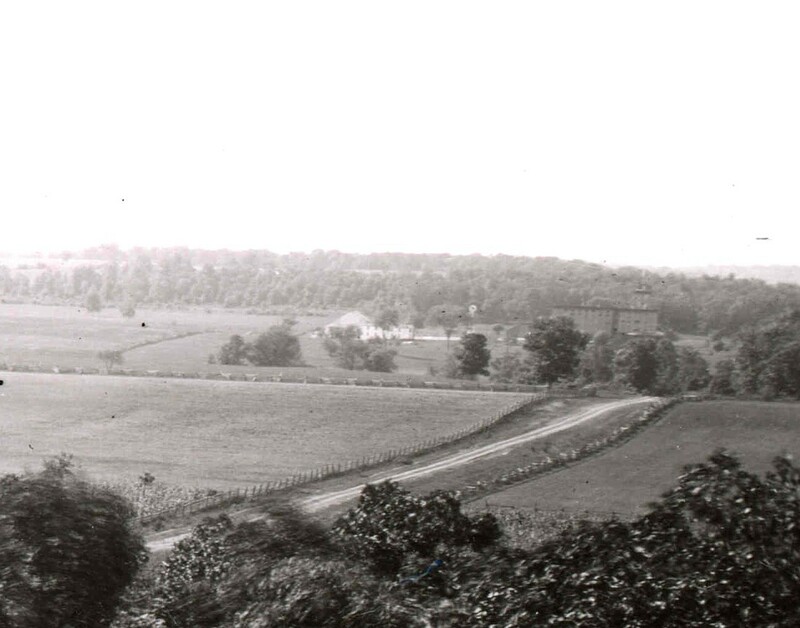 This is the view of Herr's woodlot as photographed by William Tipton in 1880 from the cupola of the Lutheran Theological Seminary. The Katalysine Springs Hotel is the large building in the distance and the woods are just to the left, beyond the hotel grounds. A woodlot that sheltered Confederate soldiers on the first day of the Battle of Gettysburg will undergo "health cuts" by the National Park Service. Some of the trees will be strategically cut down to promote a balance of younger, middle aged and older trees, according to the Park Service. Known as Herr's woodlot, this 42-acre site is in the northwest section of Gettysburg National Military Park, just west of Country Club Lane. "We wanted to establish an even mix so the trees will mature and it will remain a woodlot 50 or 100 years from now," park spokeswoman Katie Lawhon said. "It's sort of banking for the woodlot's future." The clearing effort will cost the park $600 per acre, for a total of $25,158, and Pennington Tree Expert Service of Orrtanna was contracted to perform the work. Felled trees will be left on the forest floor to allow them to decompose, so that nutrients are returned to the soils and to provide habitat. The park's tree-clearing efforts -- though at times controversial -- seek to restore the landscape to the way it looked in 1863. A six-acre parcel of densely wooded land near Culp's Hill, west of Spangler's Spring, was cleared in 2009 to allow an open view to Baltimore Pike and beyond. The park has also planted apple trees and natural hardwoods to restore acres of orchards and woodlands present during the battle. Still, clearing practices have drawn criticism from some neighbors and visitors who feel a national park should be interested most in preserving nature. Herr's woodlot saw fighting during the first day of the Battle of Gettysburg. The woods sheltered refugees of Brig. Gen. James Archer's brigade after they had been repulsed and thrown back in disorder by Gen. Solomon Meredith's Union troops, known as the "Iron Brigade. Within an hour, North Carolinians under Brig. James J. Pettigrew deployed in battle line in these woods and sent forward a skirmish line to contest ownership of the Harman Farm with skirmishers from Meredith's brigade. The southerners were subjected to small arms fire and the occasional artillery shelling before moving from the woods to attack the Union troops arrayed along McPherson's Ridge east of Willoughby Run. "Most likely the saddest use of the woods came soon after when wounded Confederates stumbled their way into the shade of the trees where they waited for ambulances to remove them from the battlefield," said John Heiser, historian for Gettysburg National Military Park. 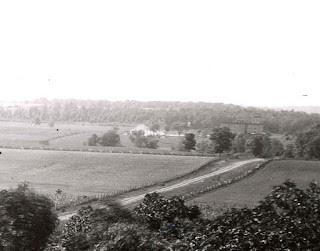 Caption: This is the view of Herr's woodlot as photographed by William Tipton in 1880 from the cupola of the Lutheran Theological Seminary. The Katalysine Springs Hotel is the large building in the distance and the woods are just to the left, beyond the hotel grounds. News---Will The USCT Be Honored With A Monument at Petersburg NMP's Crater? Isn't There Already One There? 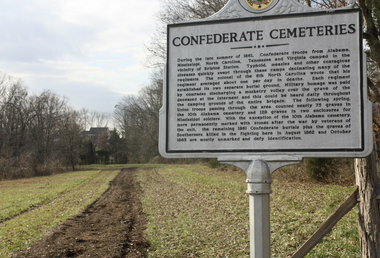 Gingrich Seeks Monument For Black Union soldiers At Battlefield, Brian J. Couturier, Progress-Index, December 29, 2011. Leading Republican presidential candidate Newt Gingrich is behind an effort to have African-American Union soldiers recognized for their role in the Civil War Battle of the Crater. Gingrich, along with co-author William R. Forstchen, wrote The Battle of the Crater: A Novel that was released in November and recounts the role that United States Colored Troops played during the Siege of Petersburg in 1864. In the acknowledgments and afterward of the book, the authors call for a monument to be placed in Petersburg National Battlefield at the site of the Battle of the Crater in recognition of "forgotten" African-American soldiers "who, on a terrible day in July 1864, did indeed offer up the 'last full measure of devotion.'" The idea of a monument for United States Colored Troops has the initial support of National Park Service officials who oversee the battlefield. "We are definitely open to putting something near the Crater to let people know about the role of United States Colored Troops," said Petersburg National Battlefield Superintendent Lewis Rogers. "Today as we approach the 150th anniversary of the battle, there is still no formal recognition of the role played by these soldiers in that fight," Gingrich and Forstchen wrote. However, the effort has stalled since Gingrich, who could not be reached for comment, announced his presidential bid. Gingrich and Forstchen wrote that Petersburg National Battlefield officials "are delighted to work with us to fulfill a long-held dream of ours to see a monument placed on the site of the Crater in memory of the thousands of USCTs who fought on that field. As far as we can have been able to find out, not a single battlefield monument to any USCT regiment exists on ground they fought for. We hope to rectify this long-overdue honor and acknowledgment." While there is no monument for a specific USCT regiment, there is a monument at Petersburg National Battlefield that recognizes United States Colored Troops on ground they fought on. The monument was placed on the Petersburg battlefield in the summer of 1993 and is inscribed: "In memory of the valorous service of regiments and companies of the U.S. Colored Troops, Army of the James and Army of the Potomac, Siege of Petersburg 1864-65." Nearby there are informational signs that describe fighting by African-American troops on June 15, 1864, where they "recorded their first major success of the war in Virginia." During two hours of fighting, African-American troops routed Confederate defenders and captured dozens of Confederates and six cannons on the Dimmock Line. The current proposal is to move the existing USCT monument to the Battle of the Crater site and reface it to refer to specific units that fought in that battle. The monument could then be rededicated. The battlefield's current management plan recommends no further monuments at the park. "We don't want a forest of monuments," Rogers said. However, the National Park Service would have to find money for such an effort and that could be a challenge in the current political climate with Congress cutting the federal budget. The effort has particular meaning for Rogers. "The USCTs are one of the lesser know things known in the Civil War," he said. "I'm an African-American and I didn't have much of an interest in the Civil War because I didn't know of the contributions of African-Americans." Rogers said many African-Americans are not aware of the major contributions of African-American soldiers during the Civil War and typically think of the period as it relates to slavery. During the war, a total of nearly 187,000 African-Americans served in the Union army. Of those, the greatest concentration of U.S. Colored Troops was at Petersburg. During the Petersburg Campaign, USCTs would participate in six major engagements and earn 15 of the 16 total Medals of Honor awarded to African-American http://www.blogger.com/img/blank.gifsoldiers in the Civil War. More than 4,000 United States Colored Troops fought in the Battle of the Crater on July 30, 1864, and represents one of the largest concentrations of African-American soldiers on any battlefield during the war. As a result of the battle, 1,327 soldiers were killed, wounded, missing or captured in the fighting. Text and Top Image Source: Progress-Index, December 29, 2011. CWL: There is a USCT monument at Petersburg. Here is the Petersburg NMP virtual cache site of the memorial. Tenth Alabama Regiment Cemetery In Virginia Uncovered 150 Years Later, Mary Orndorff, The Birmingham News, December 29, 2011. About an hour west of Washington, D.C., on a scrubby plot of land overrun by pricker bushes and in the shadow of dense modern townhouse developments, an Alabama cemetery was born. 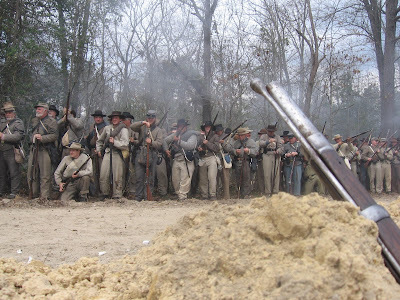 Civil War preservationists with no personal links to Alabama admit to muttering a "Roll Tide" or two as they walked across the newly cleared land, the final resting place of between 75 and 90 soldiers with the Tenth Alabama Infantry Regiment. Historicl documents and archeological study pinpointed the burial grounds, a desperate place in the late summer of 1861, when rampant disease claimed up to five or six Confederate soldiers a day at what was known as Camp Jones. There are other signs. The area is devoid of stones, except for five large rocks dug deeply into the dirt, each cut on at least one side by a man-made tool. And the area is pockmarked by man-sized depressions, not in rows, but haphazardly, as if soldiers were buried right where they died. That level of detail, however, was unknown until Dec. 3, when a crew of about 40 volunteers, led by a 16-year-old Eagle Scout candidate, descended with chain saws and strong arms and gave sunlight and a defined boundary to the cemetery. "It's one of the better Eagle Scout projects I've seen," said Rob Orrison, site manager with the Prince William County Department of Public Works Historic Preservation Division. "I was blown away by the number of people that came out." The Bristoe Station Battlefield Heritage Park is a new, lesser-known addition to an area rich with Civil War historical sites; Manassas National Battlefield Park is about three miles away as the crow flies. The Bristoe Station park opened in 2007 after a developer, Prince William County officials and the Civil War Preservation Trust reached a compromise. The massive farm property is to be developed for residential and office space, save for a 133-acre passive park marking the Battle of Kettle Run in 1862 and the Battle of Bristoe Station in 1863. The private owner who sold the land to the developer had farmed for decades around the unmarked cemetery, indicating he knew its historic value. But it was overgrown and inaccessible. So when Dane Smith of nearby Nokesville called up looking for an Eagle Scout project, park officials recommended clearing the cemetery. Smith's father, Brian, recalls hearing the details about the project. "When I heard it was an Alabama regiment, I was like, 'Great, I work for an Alabama bank,'" Brian Smith said on his second straight chilly December Saturday at the site. He is the lead Washington lobbyist for Regions Financial Corp. The volunteers, under Dane Smith's direction, cleared the underbrush, cut down trees, put up a split-rail fence and built a bridge over a creek. Their work was approved by Orrison, who told them which trees to remove and how not to disturb the ground. Tree stumps were left intact. The stone grave markers -- three of which Orrison knew were there plus two others uncovered during the work -- were marked with bright pink tape. The park had earlier used radar to detect the disturbed dirt of the grave sites so they could estimate a cemetery boundary. Soldiers marching by a nearby road in 1862 wrote of the row of cedar trees leading toward a clearing with wooden grave markers engraved with the names of the dead. Several years later, someone else wrote that the markers were in stone. "Who knows when they were changed?" Orrison said. The Tenth Alabama Infantry Regiment included companies from Jefferson, Shelby, Calhoun, Talladega, St. Clair, Calhoun, DeKalb and Talladega counties, according to the Alabama Department of Archives and History. A second overgrown plot across the pasture is believed to be where Mississippi soldiers are buried. Text And Image Source: Birmingham [Alabama} News, December 29, 2011.